There are many ways to bring about change in an organization, team, company, or other group. Here are 4! 1. Highlight the bright spots! It is easy for a leader to feel like they have to reinvent the wheel when major change is the goal. However, usually there are some employees or people already performing the desired behavior, at least to some degree. Highlight this, focus on this, reward this, validate this! Focus on why this is happening in some people and what intrinsic motivation is perpetuating this behavior. 2. Shrink the change! If I asked you to eat a whole pie right now, it would seem intimidating. However, if we divided a pie up into slices, the pie would be easier to consume. Chip and Dan Heath bring this into a context in their book “Switch,” where small victories perpetuate more small victories… instead of just focusing on one huge victory. 3. Choose your tasks wisely! In Kerry Patterson’s book “Influencer,” she urges her readers to focus on changing a maximum of 3 or 4 things. Think of the image of a person spinning a bunch of plates at a time, something that you may have seen on Letterman or in a circus. As the person spins 3 or 4 plates, the task seems relatively easy. However, as more plates are spun simultaneously, the first plates start to wobble. As more and more plates are added, more plates wobble, some may fall, and the plate spinner sweats like crazy trying to make them all spin at once. When you set out to change, spin a few plates and spin them well! 4. Lead from the front! It is one thing to talk about change and another to demonstrate change. Today, my wife and I went to the beach and read for a couple of hours. 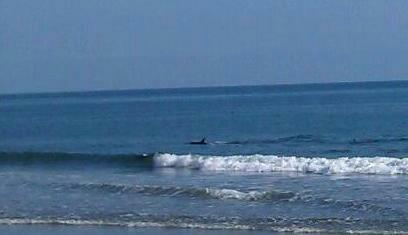 While at the beach, we saw a bunch of dolphins jumping 30 feet off the shoreline. It is one thing to tell you about this or to even show you a picture, but it’d be a bit more impactful for me to bring you along to the beach so you could see it with your own eyes. Being alongside people to experience change – or to model the behavior to your cohorts around you – shows that you walk the talk that you bring. People follow leaders who lead from the front and experience change alongside their teams. Oh yeah – by the way – leading from the front is a lot more fun than watching from the sidelines! This list can easily go on to include multiple other things. What do you think? What else would you add? What has worked for you? How about creating buy-in? The more invested people are in the company/organization, the more they will take on company goals as their own and work for them!